Mr. and Mrs. Tran have been in the nail salon business for over 20 years. They started out as a nail salon technicians and grew experience in the industries and became nail salon investors. They built out new salon locations and hired certified staff to run it along with them for several years and sold it and continue build out as they expanding the Central Florida market. Envy Nails and Spa are famous for upscale, state of the art, well-trained staff and free cocktail services. The important part of the business is the management team, Mr. and Mrs. Tran realized the importance of the employee royalties and they committed to accommodate and trained their staff how to engage and greet clients in a such professional manner and with their number one priority is customer satisfaction, they want to make sure everyone stepped in the salon will walked out happily can ever be. Both Mr. and Mrs. Tran have a daughter starting to join college so they would love to spend more time with their daughter. In the mean time, Mr. Tran never stop from innovation, he still learned new techniques and attended many nail salon shows to showcased his expertise. 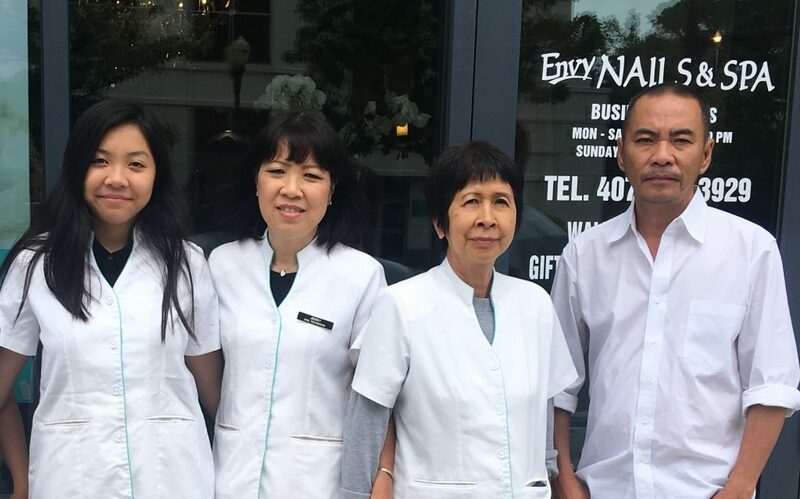 On behalf of Envy Nails and Spa, we sincerely grateful for every customers that trusted in our services and referred many friends and relatives to us for the past 20 years. Your trusts make us more motivated and innovated to products and services.